Entering the new site, it is apparent how clean and tidy it looks, especially considering it is already in operation. Most of the fleet was out working, with only a few double deckers on site. A marquee was set up in the depot, housing beautifully decorated tables and chairs for guests. Sunshine beamed down on visitors, a jazz two piece played throughout and refreshments were served. Proceedings began with a speech from Golden Tours’ founder and MD, Nick Palan who thanked everyone that attended and went on to say his company is a ‘family’, combining its staff and suppliers. He hoped his company would prove to be a good neighbour to the nearby businesses. ‘It is nice to have assets’, he said, but it is the team that really ‘makes it happen’. In his opinion, the operation wasn’t just about making money, it was just as much about being a good contributing citizen, creating employment and being good people to do business with. Finally, he thanked his wife and Financial Controller, Kamu; his son and General Manager, Mikesh and daughter in law, Samantha. Following Nick’s speech, it was Traffic Commissioner for London and the South East, Nick Denton’s, turn to speak. He said he usually visits depots when ‘people can’t operate properly’, so was glad to visit a company that does the job to a high standard for a change. Nick also mentioned it was one of the cleanest depots he has ever seen. He said it was good to see a company focused not just on making money, but as Mr Palan said, is just as much about providing a good service and being a contributing citizen. Following the speeches, visitors were invited outside where there was a ribbon cutting at the depot’s doors and further photo opportunities, with wine glasses raised in celebration. After the photographs visitors mingled and food was served. Visitors were also given the opportunity to look around the depot. 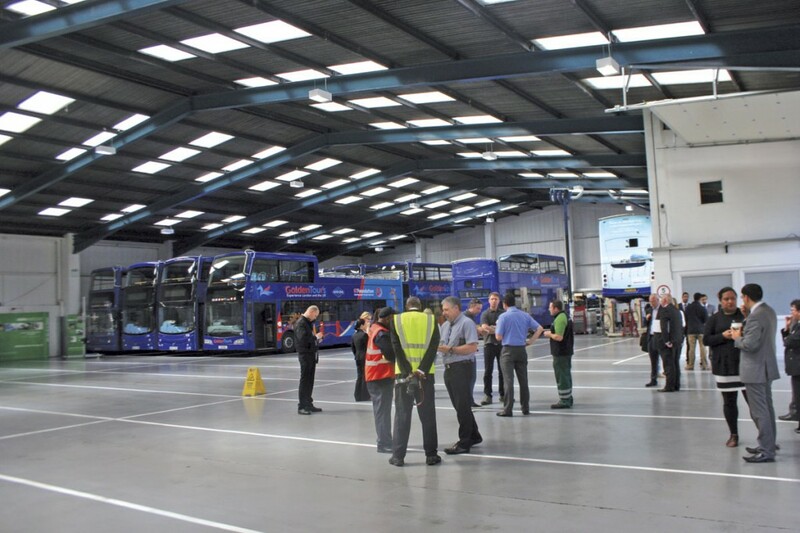 Based in an industrial estate in Alperton, the new 22,000square foot site has room for 51 buses. The company also parks the eight Volvo B11R Jonckheere 53 seat coaches it purchased last year on the hard standing outside the building. Facilities at the depot include its own toilet drop, able to deal with offside, nearside and centre toilets. 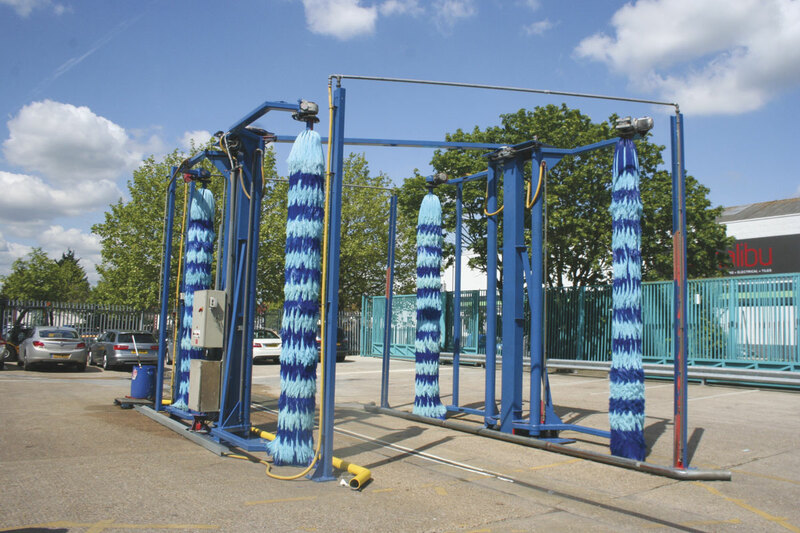 Stertil Koni mobile column lifts are used on site for vehicle inspections. 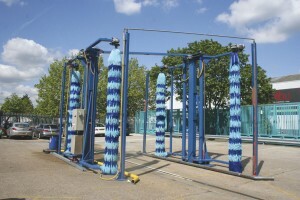 There is a bus wash on the hard standing outside the depot, which has improved things for the operator, which previously relied on another nearby operator’s bus cleaning equipment. It has its own 22,500litre capacity fuel tank now too, which means it has a secure supply and can get a better deal, having hedged its diesel costs for this year. There is also a management office on site, where vehicles are tracked using the Quartix telematics system. The programme can be accessed from a tablet or mobile and can be interrogated retrospectively to verify details for accident investigation or public complaint. Transport Manager, Andy Bassom, said the Quartix solution is much more ‘flexible’ than its previous telematics system. 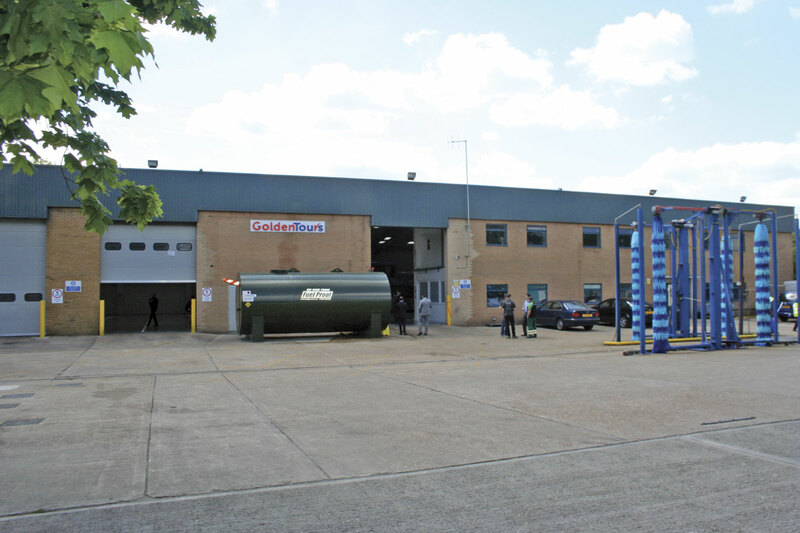 Golden Tours’ new depot replaces its previous site in Hayes, west London, which it outgrew. Its fleet filled this old facility and the company ended up having to expand into the building over the road. The decision to move into a new site was made in 2012 and Alperton was chosen as it offers good access to the A40 and is a lot nearer to London. The running distance into the centre of London has been halved at the new site, according to Andy, the fuel saving helps pay the rent. The building is on a ten year lease and Andy said that if the owner was to sell up, the company would consider making an offer for it. Although the official opening took place this month, the move actually took place in July 2013, the busiest time of the year. Described as ‘an exercise in logistics’, on the appointed day the fleet ran out of Hayes for the final time during the morning and ran into Alperton depot in the evening. A shuttle for staff was run so drivers could get to their cars when their shift finished. Some equipment was pre-sited in the run up to the move. From the depot, it operates its extensive coach tour programme, targeting the incoming tourist market. It has 80 pick up points in Central London, with coaches travelling to attractions such as Bath, Stratford-upon-Avon, Warwick and Stonehenge. It also offers short breaks further afield in conjunction with National Rail, to destinations such as Edinburgh, the Lake District and Liverpool. Easter 2012 saw the start of another of its operations, the running of ‘The Warner Bros. Harry Potter Studio Tour’ service. This employs five recently purchased Volvo B9TL MCV open top double deckers in all over Harry Potter livery. 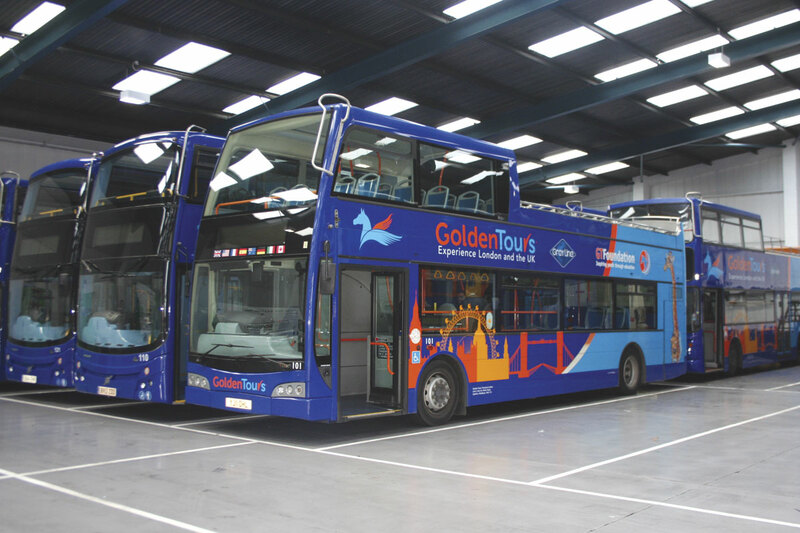 To run its services, Golden Tours has made dramatic investments in its fleet. Since 2011, it has bought 28 new vehicles, including 20 new Volvo B9TL MCV open toppers, giving Andy what he believes is one of the youngest average fleet ages in the country. As well as the MCVs and Jonckheeres previously mentioned, there are four open top Volvo B9TLs, three with Optare Visionaire bodies and one by Wrights. Additionally, it has 19 Dennis Tridents with ALX400 bodywork converted to open top, supplied by Ensign between 2011 and 2013. Multi-lingual recorded commentary systems have been fitted to all open top buses and coaches in Golden Tours’ fleet. All the vehicles have CCTV cameras installed, internally and externally. 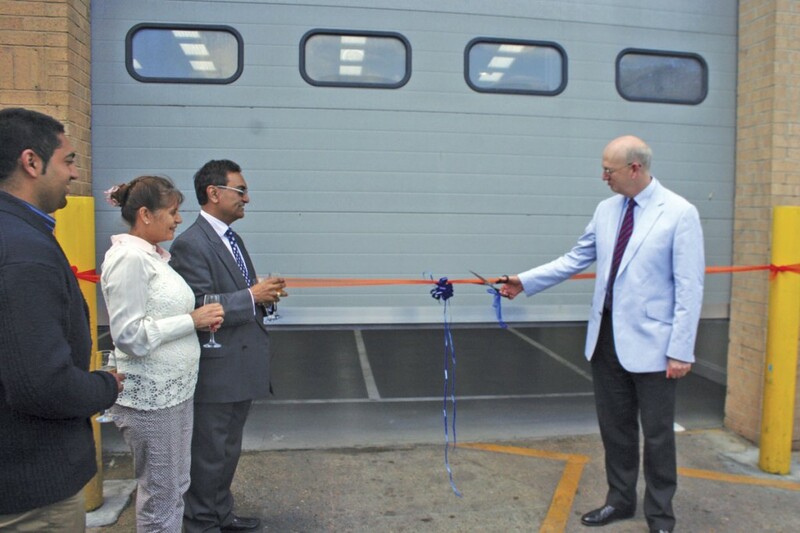 As well as marking the official opening of the new depot, the event was also a celebration of its 30th anniversary. Golden Tours started operating in 1984, offering airport transfers and coach tours to the London tourist market. Its competitors at the time were London Transport Guided Tours, Frames Rickards Tours and Evan Evans Tours. During the 1990/91 seasons, a joint programme with London Coaches was launched under the ‘DeLuxe Tours’ banner. The privatisation of London Coaches in 1992, combined with the opening of Bulleid Way, Victoria as a coach terminal and booking office, left Golden Tours in a ‘much stronger position’. The next big development came in 2001 when it acquired the business of Frames Rickards, which meant Golden Tours became the London franchisee of Gray Line. This gave access to the international sightseeing franchise’s worldwide marketing to further enhance its position in the market. In 2010, the decision was made to enter the open top hop-on hop-off market in London. The first service, the Blue Route, started in June 2011, with an hourly route operated by four buses. In the same year, Golden Tours acquired the work of the London Tour Bus Company, following the untimely death of its principal. The acquired operation became Golden Tour’s Red Route, which started operation on 23 July 2011, the same date the Blue Route was increased to run every 30 minutes. Summer 2012 was a difficult one for the operator as the Olympics created challenges with road closures and stop alterations. The following summer saw its Blue and Red Routes’ frequency increased to every 20 minutes, giving a ten minute headway over common sections of the routes. Some of the staff behind Golden Tours’ operation are recruited through an outside agency. The benefit of this is it has the advantage of saving on advertising costs and eases the process of dealing with recruits not matching up to expectations. The company only employs experienced, qualified drivers, who undergo an extensive period of training. Once passed out for service, they are subject to monitoring and ‘mystery shoppers’. The business rewards safe driving through the ROSCO scheme, with incentive payments made. Golden Tours’ move to the larger and more strategically placed new depot in Alperton has enabled an increase in services this year. Andy said the business is now in a consolidation period following its recent big investments in the fleet and facilities. The operator is now bigger and busier than ever, so the new depot comes at an ideal time, strengthening its position as it aims for the next milestone.